Last Friday’s The Libaliano Kitchen hosted one of our student's birthday. With her, we planned a personalised workshop in which she chose to review already acquired skills, such pasta and shawarma as well as new recipes to suit summer days. Home made pizza dough? The prospect of kneading and proving is to many a daunting prospect, often resulting in an industrially prepared, box- happy pizza. But what if it were possible in the span of one hour, to make dough, eat pizza and then wash up? Our potato-based recipe does such a trick. Baked blind, the yeast-free crust is then topped with quartered Victoria baby tomatoes, fresh oregano leaves and buffalo mozzarella. 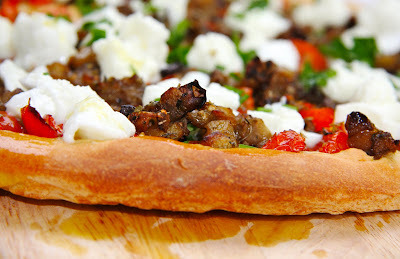 The result is a soft and crispy pizza, which is simply delicious. While Maria shared her tips on ‘how to dress pasta’, we proceeded to prepare a sauce, which encapsulates the season’s aromas and flavours: a marjoram pesto mixed with aubergine sautéed in olive oil. From there, we moved on to shawarma, lamb or chicken meat skewered on a stick and cooked while rotating slowly against a vertical grill. Our home-style shawarma is oven roasted with spices and herbs and served with tomatoes, sumac-coated spring onions and a tangy tahini sauce. As the morning was drawing to a close, yogurt panna cotta with crushed berries and Amaretti indicated the end of work in the kitchen and everyone proceeded to enjoy lunch around the dining table. 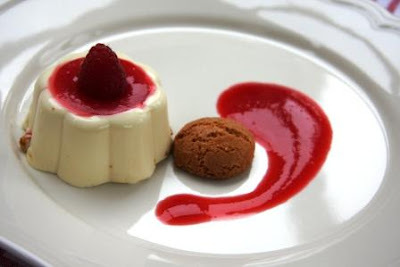 Panna cotta simply means cooked cream. To make the pudding lighter, I combined it Greek yogurt with cream. Place honey in a small saucepan and bring to a boil. keep cooking until it starts to caramelise. Once it turns a darker hue, take the pan off the heat and add the orange juice. Stir to mix orange juice and honey. Allow to cool. be careful not to get burnt by the splutter. Place the gelatine leaves in a bowl, cover with cold water and leave for 10 minutes to soften. Strain. Heat half of the double cream but don't allow it to boil. Take off the heat. Add vanilla extract and gelatine leaves. Stir to dissolve. Add the remaining cream and the yogurt. Mix well and add the honey mixture. Divide the cream between five panna cotta or jelly moulds. Cover and place in the fridge until set, this can take over 2 hours. To turn out the moulds, dip their undersides in boiling water from the kettle to loosen the mixture and pop a plate over them, then turn the whole assembly upside-down. Sprinkle with crumbled amaretti and drizzle with hot raspberry coulis. Cook the potatoes, skin on, in plenty of boiling water until tender, approximately for 40 minutes. Drain, peel and mash with a potato ricer. Leave to cool for 5 minutes. Add flour, oil and salt to mashed potatoes and mix well. Knead for 5 minutes until you get smooth elastic dough. Grease a pizza pan with oil and press the dough gently pressing with your fingers until it covers the tin base. Bake the potato dough “blind” (without any toppings) for 15 minutes, until golden on the edges. Remove from the oven. 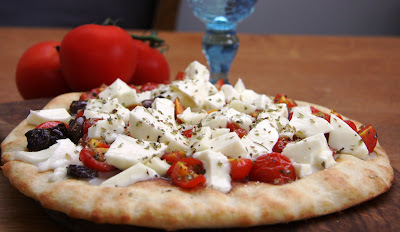 Add the tomatoes, the olives, the capers and the oregano and bake for another 5 minutes. 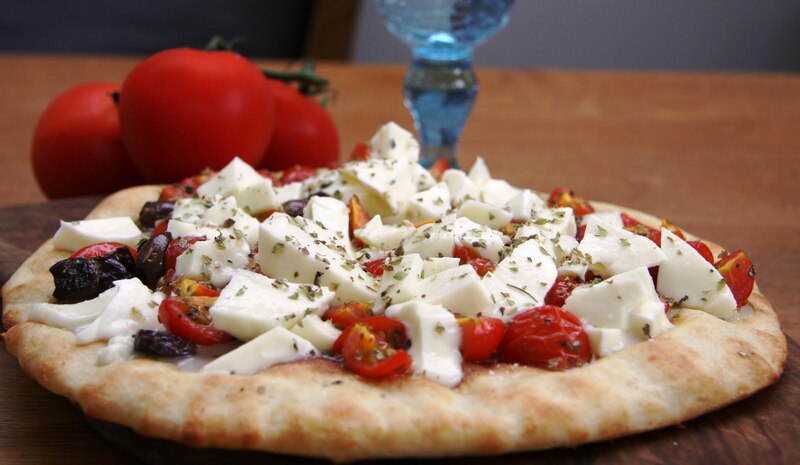 Remove from the oven, add mozzarella and serve. but the marjoram pesto! tell tell. Alice, hi, just checked your blog! Love your antics in Dahyieh! i have added the Marjoram Pesto recipe in a new entry please check it. hi, i tried making the potato pizza but there was something wrong with the texture. Do you recommend any particular type of potato or adding an egg? Sorry about the delay in answering.. It is best to use baking potatoes as they are very floury. Please make sure that the potatoes are quite dry when you put them through the ricer. By this, I mean, take them of the water as soon as they become soft and strain completely. The heat will absorb whatever moisture is left on the skin and the potatoes become ready for you to mash. Whenever you make dough based ingredients such as potato pizza or gnocchi, you need to be aware of the level of humidity. If the level is high you need to add a tiny amount of flour for the dough to combine well. There is no need to use eggs. All the best and please keep us informed! ​Pure hardwood is the fuel for Traeger's signature flavor. Traeger owners and BBQ enthusiasts agree that wood-fired flavor is what they love most about their How do Traeger smokers work?